There’s a plethora of social media management tools available such as Buffer, Tweetdeck, IFTTT and Dlvr.it just to name a few. Everyone has their own favourite but for complete novices, here’s how you can get started with Hootsuite – probably the best free tool available today. On the free version, you can connect up to 5 different social media profiles on a single account. You can also connect any company/brand page on Facebook or Google+ as long as you are a page administrator or owner. Pro tip: You can add your favourite LinkedIn groups to Hootsuite and change them as often as you need to. The easiest way to organise your dashboard is to use a different tab for each social network. 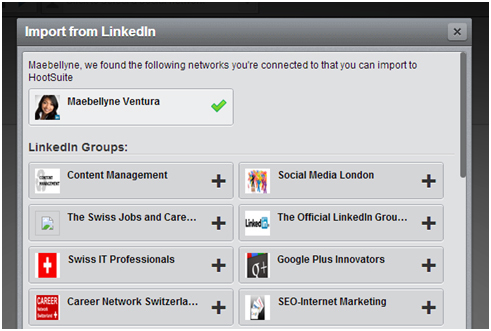 For example, within each tab you can create separate streams for each LinkedIn group that you have connected to your Hootsuite account. The streams will then show you the discussions happening within each LinkedIn group. You can also add an additional stream that shows all the updates you have scheduled to go out and gives you quick access in case you need to edit anything. 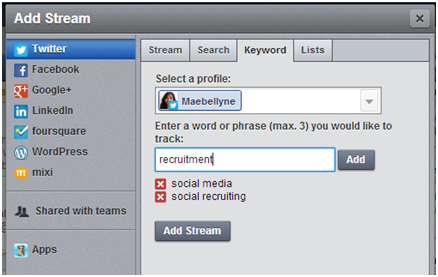 If you’re using Twitter, you can create a stream for each keyword, hashtag or brands that you are monitoring. You should also set up separate streams for your scheduled or sent updates and any Direct Messages (DMs) your receive. Hootsuite, let’s you add up to 10 streams in a single tab so you can also include a tab for “Mentions” and “My Tweets, Retweeted”. By adding these streams, you can easily track tweets that are related to you and respond accordingly. Pro tip: Instead of just sending a thank you whenever someone retweets or mentions you, you can also follow them or “Favourite” one of their tweets as a sign of gratitude. Hootsuite’s real strength is obviously in allowing you to schedule and post to multiple networks, profiles or groups with a single click. When creating a new post, just select the profiles you want to use at the top of the page. Enter your message in the compose box. If you’re sharing an article or a job advertisement, use the handy link shortener to attach the link to your update. Pro tip: If you want to add an image thumbnail to your LinkedIn updates, select a Google+ or Facebook account at the same time. This will force Hootsuite to look for an image to accompany your LinkedIn post. Once a thumbnail is generated, you can then deselect the Facebook or Google+ account if you don’t need them and hit send. Once you’ve finished composing your message, you can choose to send it out immediately or you can choose a specific date and time in the future. This feature is especially useful if you want to queue updates that will go out later in the week or while you’re away on holiday. Pro tip: Use the AutoSchedule feature when posting to multiple LinkedIn groups. The AutoSchedule feature chooses the optimal time to post on each channel. This means that your update will be posted to the group when it is most active; with the added benefit of not spamming your followers’ news feed with multiple simultaneous updates. If you’re a Twitter user and/or a Google+ page administrator, Hootsuite gives you handy access to a contacts list from your Twitter and Google+ networks. From this page, you can easily follow them or check out their bio. Although Hootsuite only supports Twitter, Facebook, Google+ Pages, LinkedIn, Foursquare, WordPress and Mixi, you can still use it to monitor other networks. You can install Apps as streams and monitor your feed on Youtube, Xing, Viadeo, Instagram, Flickr, etc. Depending on the app, some will allow you to post an update from within the stream although you won’t be able to use Hootsuite’s scheduling feature. The Hootsuite Syndicator is Hootsuite’s RSS app. It was built as a replacement for the now defunct Google reader. Once you’ve set up your Hootsuite Syndicator Streams, all the content you want will be available to read and share straight from your dashboard. Hootsuite offers browser extensions for Chrome and Firefox. The Hootlet extension lets you share any webpage without having to open Hootsuite on another tab or window. If you’re so inclined, Hootsuite also offers a mobile app for Android an iOS. The functionality is very similar to the desktop version so you can rely on an uninterrupted workflow, regardless of the device you’re using. The free Hootsuite account is a powerful tool for any social media user’s toolbox. For added features such as analytics reports, bulk scheduling, team accounts and approval processes, you can easily upgrade to the Pro version.